Online marketing is an increasingly data-driven and high-paced industry. Whereas 20 years ago feedback was slow to return, and changes were periodic, today the market moves at breakneck speed and information is produced almost instantly. Click-through rates, views, time spent on page, and other information is now available in less than seconds, and with millions of data points being created every minute, understanding them easily has become vital for success. Today’s marketing analytics tools do much of the heavy lifting when it comes to preparing data, but interpreting raw numbers remains a time-consuming task for marketers that are notoriously busy managing multiple channels. Marketing dashboards have become a crucial tool for marketers who must constantly make decisions based on up-to-the-minute information without the time or ability to parse through long datasets. 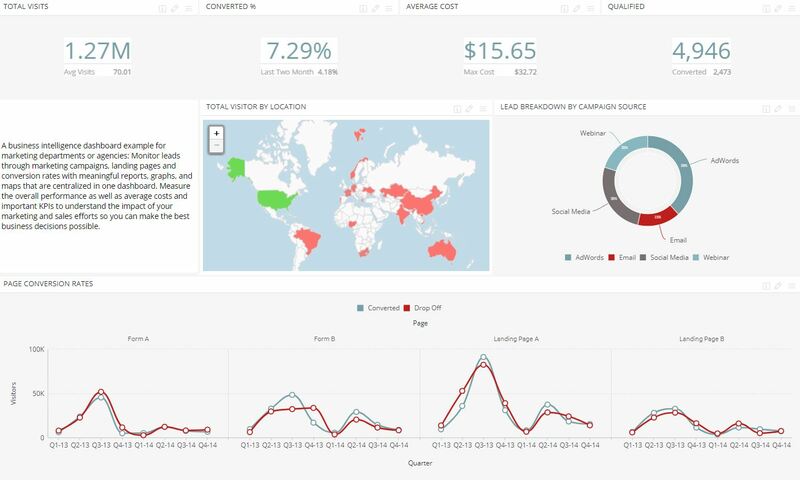 This article will help you understand how visualizations can optimize your marketing efforts, and where to uncover the best sources of data for your dashboards. What are the Most Common Marketing Data Sources? The best visualizations are those that start by collecting the right data to display. However, not all data is created equal, and more importantly, there isn’t a single source that is better than others. Different data streams shine a light on each part of your marketing strategy and can help you create more valuable visualizations. Website data – One of the most standard sources for marketing data is a company’s website and traffic information. Website visitors create thousands of touch points based on their interactions on your site, including which webpages were visited, how effective each anchor was at leading to different pages, how long people are spending in each area and more. This data is useful for optimizing internal tactics as well as knowing what works and what doesn’t. Ad data – If your business creates ads that are placed on different websites, these also produce vital data for your marketing team. Ads reveal click-through rates, ad effectiveness, views, lead conversions, and are an excellent source of top-of-the-funnel data. CRM data – Customer relationship management suites represent a crucial part of any organization’s front-end operations and can reveal important demographic and background data about marketing success. This includes delivering a better understanding of leads to determine high-value ones, consumer behaviors, preferences, and more. Financial and sales data – While this is further along the funnel than most marketers would use, understanding sales data creates important feedback about the marketing pipeline. This includes information about lead conversion, how effective different steps in the funnel are, and how well people are responding to current strategies. Conversion Rate – Conversion rates are an essential component of determining a marketing strategy’s success and effectiveness. This visualization focuses on displaying both the total number of possible conversions (visitors to your site, number of ad views), as well as the actual amount. Using a line chart can show historic conversion rates and measure changing figures. Moreover, bar graphs can break down conversions by location as well as channel, giving you a better idea of which channels are most effective. Website Traffic Leads – Measuring how well your website converts leads into paying customers is critical, so a quick glance at the dashboard should give you the full picture instantly. Using a simple table with the bounce rate along with the number of leads that are converted highlights how efficiently your site is converting leads. More in-depth visualizations may include maps that breakdown conversions by region, as well as historical data that shows when conversions are most likely to occur. New Visits – More than overall traffic numbers, the percentage of new visitors is a good indicator of how well your marketing strategy works. However, a balance between new and old visitors is important as it shows healthy traffic and return visits. A simple gauge or box that measures the percentage of new visits is a great first look, but you can use bar graphs to measure aspects such as clicks, leads generated and more, while using bar charts to measure the percentage of new visits converted to leads against those that do not return. Marketing visualizations are necessary in an industry where you must make decisions in seconds based on real-time data. By simplifying your data and structuring it with easy-to-understand visuals, you can make sounder choices by deriving better insights from your data.